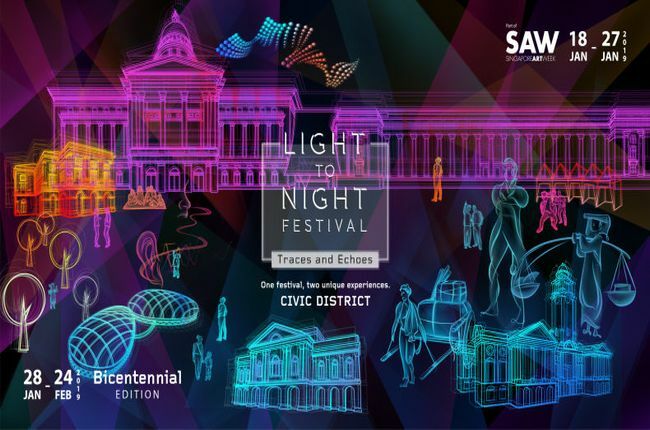 Light to Night Festival is an annual urban art event that celebrates the stunning Civic District of Singapore. It aims to make art accessible, bringing a range of creative and artistic expressions to a wide audience. Experience artworks and events inspired by histories and stories across the various indoor and outdoor festival locations! This year's festival comprises 2 editions for Art Week (18 Jan - 27 Jan) and Singapore's Bicentennial (28 Jan - 24 Feb). Discover and experience special public art commissions around the Civic District with the return of Arts Skins on Monuments by Brandon Tay and Safuan Johari on the facades of the National Gallery, The Arts House, Victoria Theatre & Victoria Concert Hall, and the Asian Civilisations Museum! Explore outdoor installations fashioned by Tell Your Children and MessyMsxi around The Arts House featuring works inspired by a range of familiar fantasies and spellbinding stories. Other commissions at ACM Green will respond to the museum's collection and history while Kaylene Tan and Ben Slater’s audio installation, Under the Five Trees at Esplanade Park will combine sound, music, poetry, narrative and landscape design to explore the area’s rich background.